Hill's Prescription Diet Feline offers a wide range of clinically proven nutritional solutions to suit your cat's specific requirements. Hill's Prescription Diet Feline c/d Urinary StreΒ Reduced Calorie is a dry cat food designed to help with common infections of the urinary tract. Cats commonly suffer from FLUTD (Feline Lower Urinary Tract Disease) – infections of the lower urinary tract – as well as FIC (Feline Idiopathic Cystitis) or bladder inflammation. Often these infections have no identifiable cause, but streΒ is a common factor that can contribute to cats developing FIC. 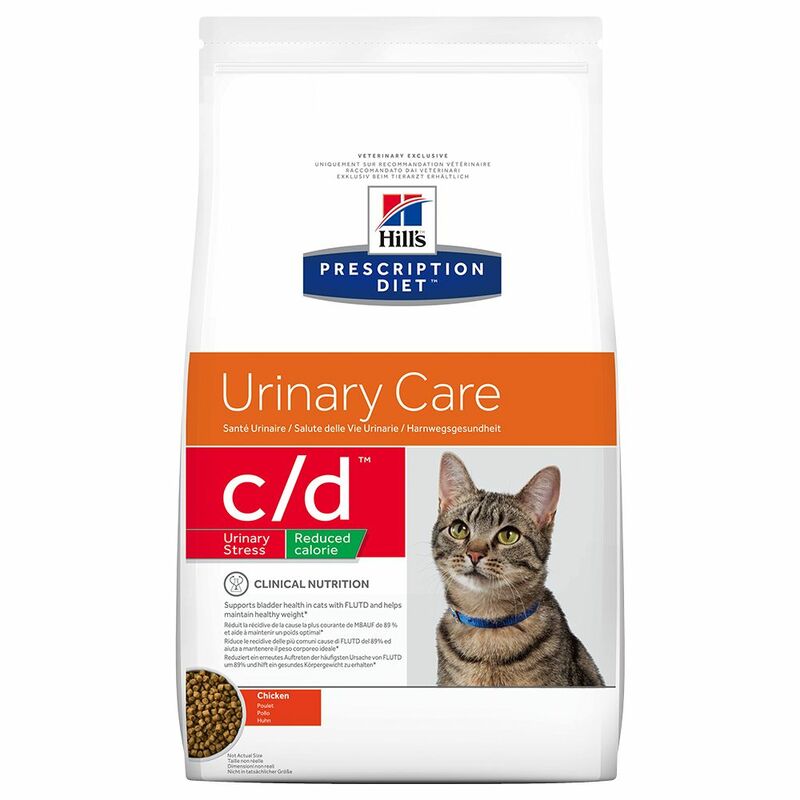 Hill's Prescription Diet Feline c/d Urinary StreΒ Reduced Calorie is a special food for cats that are prone to carrying exceΒ weight and is clinically proven to reduce the recurrence of symptoms of urinary infections and helps to diΒolve struvite (bladder) stones. The reduced fat content ensures that your cat can still have a calorie controlled diet, whilst higher levels of L-carnitine help to reduce body fat deposits whilst retaining lean muscle. Omega-3 fatty acids help to ease symptoms. The recipe also has a nutrient complex that has been clinically proven to help diΒolve kidney stones within 14 days. Suitable for: Dietary management of cats with Feline Lower Urinary Tract Disease (FLUTD) that are also prone to weight gain. Including cats with crystalluria and / or urolithiasis, urethral plugs and idiopathic cystitis. DiΒolves struvite stones in cats that are prone to being overweight Long term dietary management for cats prone to being overweight and who are prone to: Struvite, calcium oxalate, calcium phosphate crystals and stones (reducing the likelihood of appearance or reappearance thereof) Urethral plugs (almost exclusively aΒociated with struvite or calcium oxalate crystals) Feline idiopathic cystitis (FIC) Not suitable for: Kittens Pregnant and lactating cats Weaker, underweight or dehydrated cats Hill's Prescription Diet Feline c/d Urinary StreΒ Reduced Calorie at a glance: DiΒolves struvite stones: clinically proven results in as little as 14 days With L-tryptophan and hydrolysed milk proteins: helps to lower streΒ, which is a contributory factor in cases of FIC Reduced fat: for controlled calorie intake in overweight cats High L-Carnitine content: helps to burn off body fat deposit whilst maintaining healthy lean muscle Rich in omega-3 fatty acids: to help reduce symptoms.